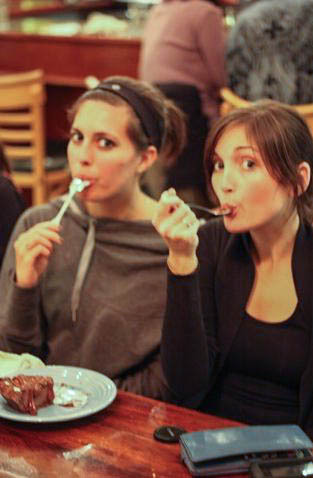 She’s an amazing girl with awesome recipes and is getting married next year, too. Enjoy <3 #summershapeup friends, don’t forget to leave a comment to check in today! Hi Fitnessista readers! I’m Brittany the lady behind Eating Bird Food, a blog that features nutritious and tasty recipes, workouts and a glimpse into my daily life, which is currently being taken over by wedding planning. Through my posts, I try to show that living a healthy lifestyle doesn’t have to be boring or bland and that small changes can create a big impact! I have a ton of favorite ingredients but if I had to narrow it down to just one, I’d say my current fav is leafy greens. 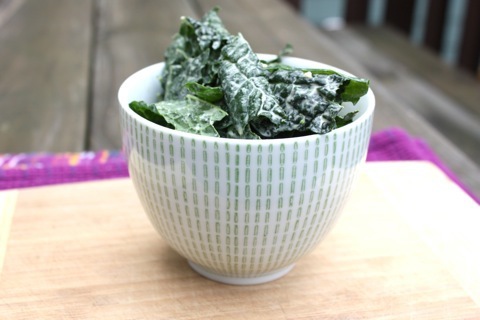 Kale, spinach, collards, swiss chard… I love them all! They’re literally the most nutrient dense food you can eat. Lately I’ve been on a green smoothie kick and each day I’ve been making a different green smoothie as my afternoon snack. 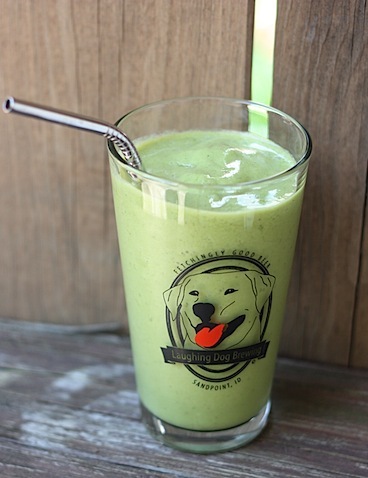 Check out my recent green smoothie post for the benefits of drinking your greens and delicious smoothie recipe with banana and peanut butter, The Green Elvis. I’ve also been hooked on collard wraps! 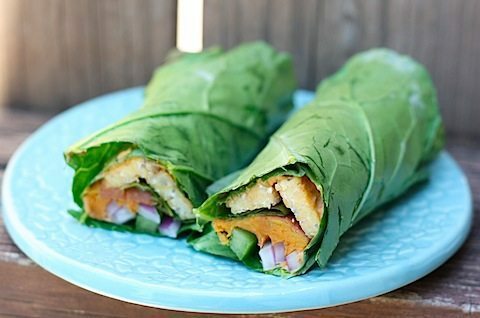 These tempeh and sweet potato collard wraps are my new obsession. And I’ll always have a soft spot for my garickly kale. It’s a copy-cat version of the garickly kale from the Whole Foods hot bar and it’s amazing. Thanks again to Gina for the opportunity to guest post. I hope you all enjoyed this little peek into my blog and life. Have a lovely day! Check in by leaving a comment when you finish your Biscuits are Burning cardio today! 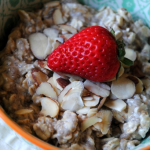 Love Brittany and all of her amazing recipes – and her blog name is adorable, too! Can’t wait to see how her wedding turns out. Hope you’re having a blast, Gina! Can you please tell me more about HIITs and steady state cardio? You said that HIITs can be done 2-3 times a week… What counts as a hiit workout and what is a steady state cardio ? What steady state cardio can I do at home without any equipment ? Hi! 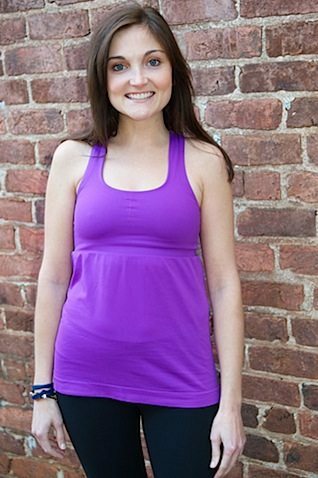 Gina has a great post about HIIT: http://fitnessista.com/2011/06/readers-request-hiit-me-baby/. Basically – and someone can correct me if I’m wrong!! – HIIT workouts consist of really intense cardio followed by a rest/recovery period. For example, if you’re on a treadmill, you can run for 30 seconds and then walk/jog for 1.5 minutes. 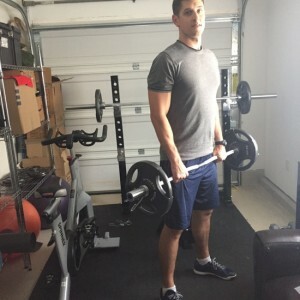 I don’t have equipment, so I do high impact cardio exercises – jumping jacks, burpees, high knees, etc. – for about 30 seconds, and then I walk around or do a light jog around the room for another 30 seconds to bring my heart rate down. Steady state cardio consists of activities like running, biking, etc., and your heart is elevated at a consistent rate (instead of spiking up and down like with HIIT). Workout DVDs are my go-to on those days! I’m no expert at all, but I hope this helped! Congrats on your engagement! You and your fiance seem like you’re really on the ball, I’ll have to check out your wedding tips. My boyfriend and I just got engaged on Friday!! Fun post.. Yay for weddings – congrats! 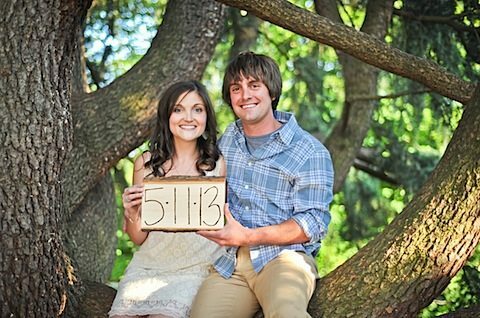 Love the engagement photo of you two lovebirds in the tree! Congratulations on your engagement! I am going to try collard wrap recipe. Have not seen anything like that before. I’m not a fan of tempeh, but I’ll just leave that out. I bet it will be quite good with the hummus and sweet potato and all the sweet and savory mix. Thank you Maddy! I’m sure the wrap will still be good without the tempeh. Enjoy. Best of luck with your wedding planning! I was just married last month and it was such a whirlwind experience. And for a bit of workout humor, in the middle of my second circuit (during the burpees), I got a text from my husband asking if I would pick up some mint choc ice cream on my way home! It definitely added a little extra fire to my workout! Ah, I am new to Instagram and am confused. How do I follow you (Gina) and post/share my SSU workout pics? I definitely stalked your collard wraps a few weeks ago, they look amazing! Great blog post! I wish I loved HIIT as much as you. Ha! 😉 But I tend to stick to just comfortable steady state cardio. I think I’m in love with this kale salad. Why, oh why, did I not buy Tahini today?! Hope California is awesome! Just finished SSU workout 3 (i’m a week behind) and I’m sweating buckets! Great workout! By the end of the frog crunches, I was wiped out!! Ooo! those collard wraps look sooo delicious! Im always trying to find alternatives to using tortillas and that looks perfect! Oh, I love eating Bird Food! I also seen you in Fitness this month pretty lady (: I swear, your everywhere! lol! Hmmm…I think I’ve found a new blog to follow! Those recipes are right up my alley. I can’t wait to give them a try! Making wraps with greens is so perfect for a light summer meal! i’m getting married on Oct. 26, 2012, and I can’t wait!! planning has been fun!